I love toffee and chocolate. Any how, any way…any time…any day. You get the picture. This combination is one of my favorites. Adding in sweetened condensed milk just adds an extra decadent feeling to these Heath English toffee chocolate bars. They are the ultimate comfort food bar recipe. I am a Heath Bar Nut. It has been my favorite candy treat since I was a little girl. Imagine my delight when I was browsing in the baking aisle recently to discover that there is actually a Heath English Toffee Bits product. This was a match made in English toffee loving, mad blogger lady heaven. I just had to try them in my next baking creation. These decadent Heath English toffee chocolate bars will be the hit of any gathering. 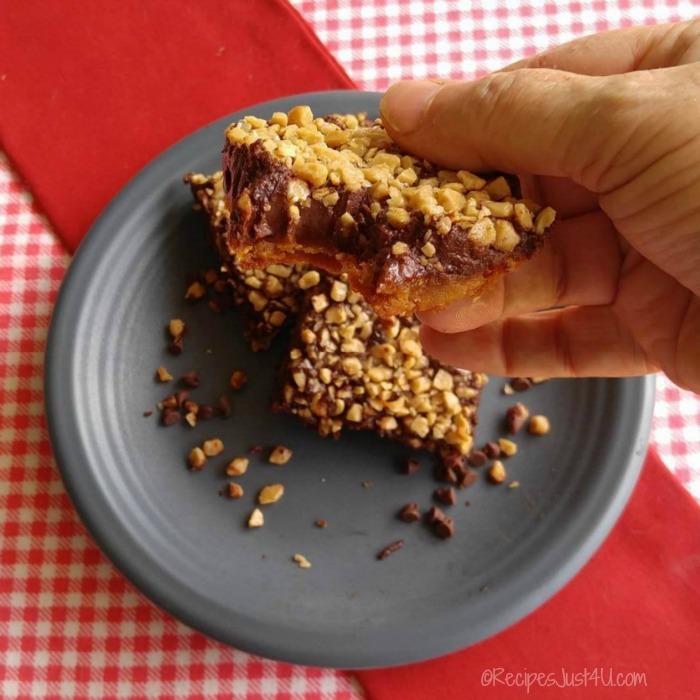 These Heath English Toffee Chocolate Bars are not the easiest dessert recipe that I have ever made, since it requires several individual steps, but it is worth every single task! I started by gathering all my ingredients together. Just look at what will go into these delicious toffee chocolate bars. I am just drooling by looking at the things that will come together to make this perfect sweet treat. The Heath English Toffee Chocolate Bars are made in three steps. Each luscious layer is prepared and then baked for a bar that stands up well when it is done and looks perfect. The first step is to line a 9 x 13 inch baking pan with either foil or parchment paper and then spray it to make it easier for the bars to release later. I used my Misto sprayer and it worked beautifully. Beat the brown sugar, butter and flour in the bowl of a stand mixer until it is a thick smooth consistency, then press it into the bottom of your prepared pan. Bake until it is light golden brown. Next comes the butter and condensed milk layer. These ingredients are heated on the stove in a saucepan for a few minutes until the mixture is starting to thicken slightly, and then poured over the cooled crust layer. Be sure to keep the heat no higher than medium and to stir all the time or you will end up with some burnt bits. I found it easiest to spread the layer by tilting the pan until the condensed milk and butter mixture covered the whole crust. Into the oven again it goes to cook the creamy layer. The layer of chocolate chips is next. Easy, peasy, just combine the chocolate chips in a microwave safe bowl with the heavy cream until it has melted and then spread them over the base, bake a few more minutes and then use a spatula to smooth out the melted chocolate. The final step is to add the Heath English toffee bits over the top of the melted chocolate. Cover it well and tamp them down slightly so that they will stick to the chocolate well. Once everything is well cooled, you can cut it into squares. I placed my baking dish in the fridge so that it would set well and make cutting easier. These Heath English toffee chocolate bars are rich and creamy and chocolately and crunchy from the toffee bits. It’s as close to a Heath Bar as you can get in a baked good. SO GOOD. I dare you to eat just one! Biting into one of these delicious bars reminds me of my favorite Heath Candy Bar, but with more oomph. They are the perfect sweet treat for those who love the combination of chocolate and toffee as much as I do. 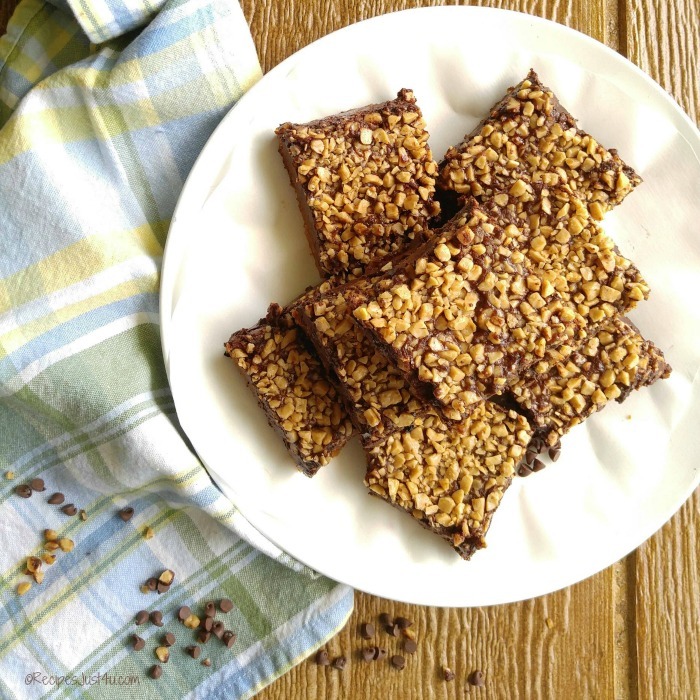 The next time you are looking for a special dinner recipe, a treat for your child’s class, or something to take to a pot luck dinner that will wow your friends, try these Heath English toffee bars. I promise you that everyone will be asking for your recipe! For more scrumptious desserts, be sure to visit my Pinterest Sweet Endings Board. Preheat the oven to 350° F. Line a 9 x 13 inch pan with foil or parchment paper and spray with a cooking spray. 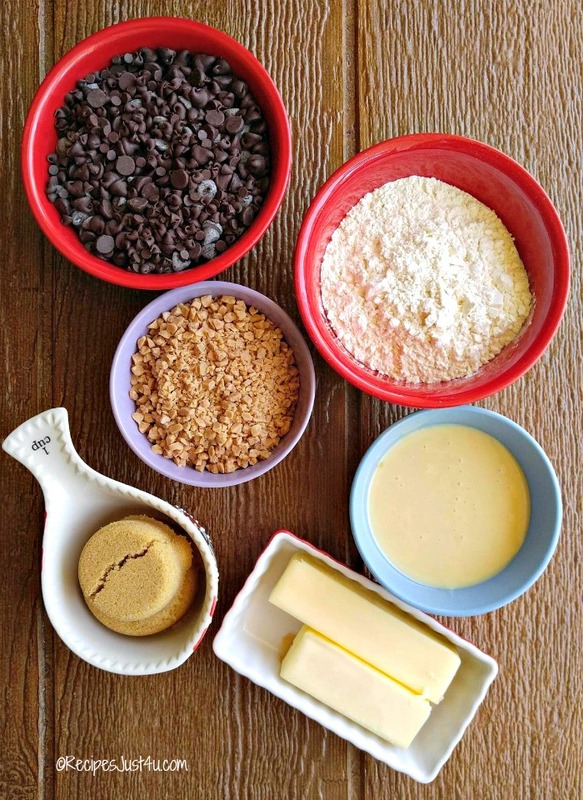 In the bowl of a stand mixer, beat the brown sugar, flour and butter until well blended and creamy. Press this mixture evenly on to the bottom of the prepared pan. Bake at 350 for 15 min or until the crust is light golden brown. Remove from oven and set aside to cool while you prepare the filling. 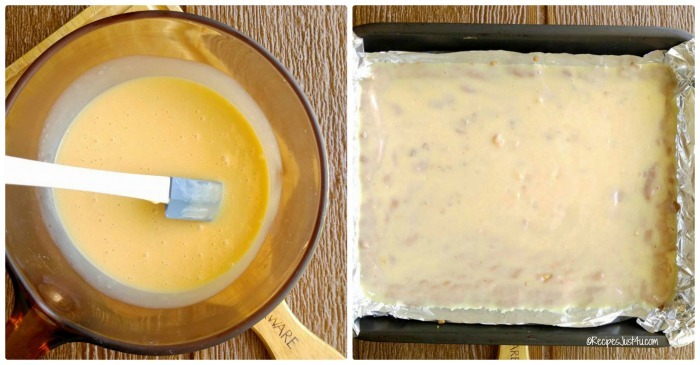 In a sauce pan over medium heat, combine the sweetened condensed milk and butter, stirring constantly, for 8-10 minutes until the mixture has thickened. Spread this mixture over cooled crust. Return to the oven and bake for 10 min or until golden and bubbly. Place the chocolate chips and heavy cream in a microwave safe bowl. Heat until the chocolate has melted and stir until smooth, 2-3 minutes. Spread the chocolate chip mixture evenly over the top and bake an additional 2 minutes until the chocolate is soft and has a shiny texture.. Remove from oven. Sprinkle the Heath English toffee bits on top, pressing slightly into the chocolate.layer. Cool completely and then remove from the pan and cut into bars. Store in an airtight container. May also be stored in the fridge, but bring the bars to room temperature before serving. I still split the peppermint patties with dad! These look so yummy! haha I remember, even when I was little Heath bars were your candy of choice! Well, those and york peppermint patties, but I think that’s just because those were easier for you to split with me!